Staring at the stars offers a glimpse at something greater than ourselves. When I was little, 6 or 7 years old, my house would remain lit up and full of life long after my bedtime, and I just hated going to sleep. I would pester whoever was around to talk with me, asking all kinds of questions. The conversations I remember most had to do with the night sky and the expansiveness of space above. What is out there? Where does it end? What is beyond what we see? My father, an engineer, would answer my questions by pulling out paper and pencil to draw rocket launch trajectories, stages of engine separation and orbital flight projections beyond the atmosphere. My grandmother, a physics teacher, would talk about the universe in terms of astronomy and explain the placement of planets in relation to the sun and the moon. My great-grandfather, a retired veteran, would pull out his pocket watch and teach me about Earth’s rotation, the changing seasons and the passing of time. My mother would peck me on the cheek and tell me to stop procrastinating and go to sleep. It wasn’t until I was in college in Arizona, which is like being on a different planet for a Russian immigrant kid, that I found myself asking the same questions about the nighttime sky as I did when I was 6. When friends came to visit, my favorite local attraction to show them came from driving into the desert and turning off the car lights. Sitting under the canopy of the star-filled sky would usually silence even the most talkative. It was there I encountered my soul. I am so grateful to have grown up in a family of scientific thinkers. The challenge of my adult life has been to also discover the value of exploring the expansiveness of sky through spiritual imagination. 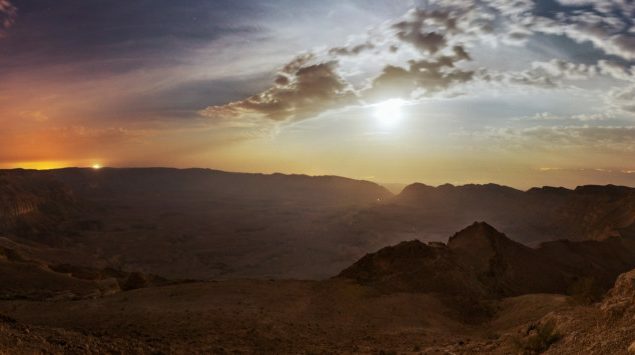 It is not a surprise that one of my favorite Torah texts is about Jacob running away from home and finding a place to sleep for the night with only a rock for a pillow. He dreamed that he saw a ladder that rested on the ground with its top reaching to heaven, and angels traveled up and down. In the dream, G-d appeared next to Jacob and promised to protect him in all his journeys. The poet Jane Hirshfield describes the mystical experience as the perception of “the extraordinary within the ordinary by changing not the world, but the eyes that look.” Jacob is a complicated, deeply flawed character whose life’s journey is filled with betrayal, dishonesty and family drama. Yet he looks through the eyes of a mystic and, with a rock for a pillow, dreams a vision of the holy. When Jacob woke up from his dream, he was shaken up and said, “How awesome is this place! This must be the house of G-d and the gate of heaven.” I read Jacob’s narrative, and I wonder: Why him? He steals his brother’s birthright, he tricks his father into blessing him, and he runs away from his troubles. Yet he has visions and a relationship with G-d. Perhaps the message is that our ability to belong is within reach no matter where we are, how far away from home, running away or returning. I am struck by how often I meet people who do not pray from the heart as if they are not pure enough or good enough or knowledgeable enough and need an intermediary. Jacob’s dream reminds us that we are worthy of entering holiness, even in our brokenness. We can feel at home in the world by simply being still under the canopy of nighttime sky. May we see the extraordinary in the ordinary and be aware of the entrances around us. And may we approach our dreams with openness and curiosity, for they have the potential to nourish us with meaning.